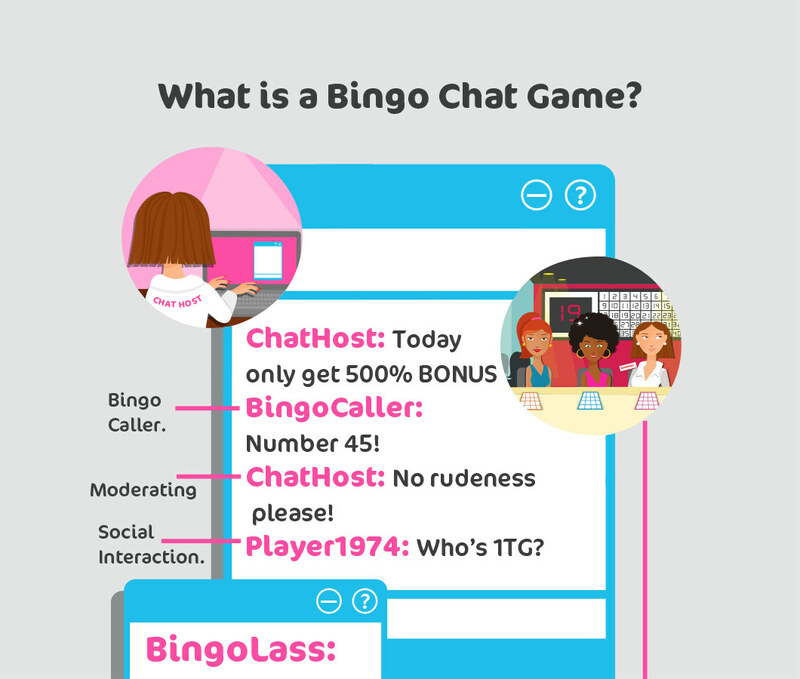 What Is A Bingo Chat Game? A chat game contains pretty much all the features of games that take place inside a physical bingo hall. There is a real chat host (CH) who moderates, entertains, and makes announcements regarding bingo promotions. There is also a bingo caller who calls out the numbers, even though these can be automatically daubed (marked). Most importantly, chat games allow for the kind of social interaction that takes place in the real world. In bingo chat games you can meet new friends and fellow players, also known as “roomies”. You can even choose to chat with your roomies from within the group chat or in a private chat window! Players can type to each other, make comments, crack jokes and have plenty of fun. Bingo chat games take place inside an online chat room. The bingo chat room is meant to replicate a bingo hall. Chat games have hosts, moderators and bingo callers. Bingo chat games allow for social interaction via online chat. Bingo chat games are tons of fun!. What Are The Common Types Of Bingo Chat Games? Up-Down Buddies :- If you win a prize, the two players listed above and below you on the chat room player list also win a prize. Similarly, if the roomy listed immediately above or below you wins, you win too! Alphabet Buddies :- Players whose usernames begin with the same letter as the winner will all win at once. 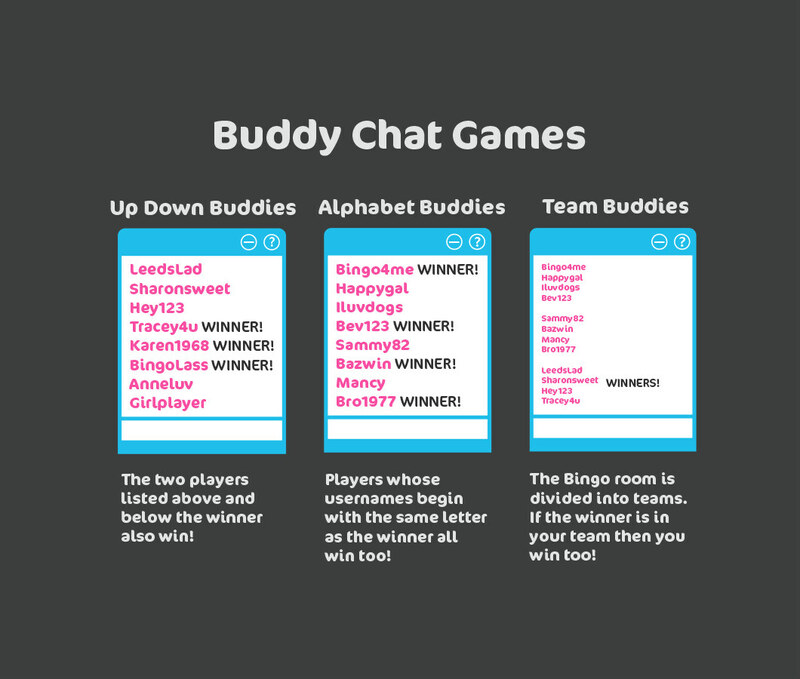 Team Buddies :- The bingo chat room is divided into teams and the bingo winner’s team all win a bonus prize. Birthday Buddies :- A prize goes to all the players who share the winner’s birthday! Trivia chat games are a bit like a quiz, where players are challenged by the bingo chat host to answer general knowledge questions. 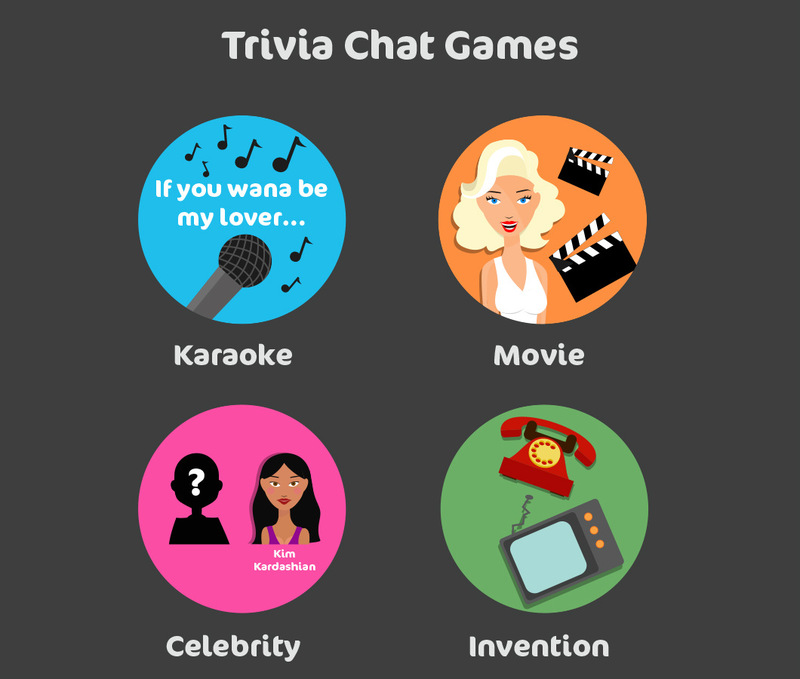 Just like our favourite general knowledge games, trivia chats offer questions in all the various categories, including culture, entertainment, history, geography, politics, etc. In this fast paced chat game, the first person to answer is the winner. Karaoke Trivia :- The host will post the beginning lyrics of a song and whoever completes the song or names the singer wins. Movie Trivia :- The chat host posts a quote from a famous film. The first one to name the film is the winner. Celebrity Trivia :- The chat host might post one half of a famous celebrity couple and the first player to name his or her partner wins the game. Invention Trivia :- The chat host will mention two items that were invented during the same era. The players have to guess which invention came first in order to win. 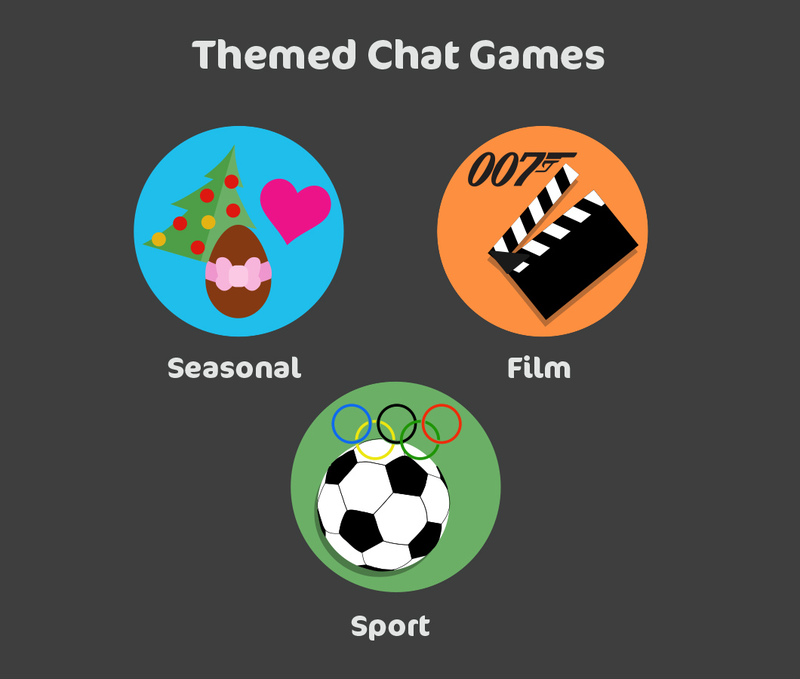 Seasonal Themed Chat :- Seasonal themed chat games come around at certain times of the year, such as Christmas, Easter and Valentine’s Day. First Ball Out :- In First Ball Out, the players have to predict which ball will be called out first in order to win. Winning Number :- In Winning Number, players need to guess the final ball to be called out. Mirrors :- The first player to spot two mirroring numbers wins the game. Examples of mirroring numbers are 34 and 43, or 27 and 72, etc. Eggs Up :- The Eggs Up winner is the first one to guess a pre selected number that ends with zero. 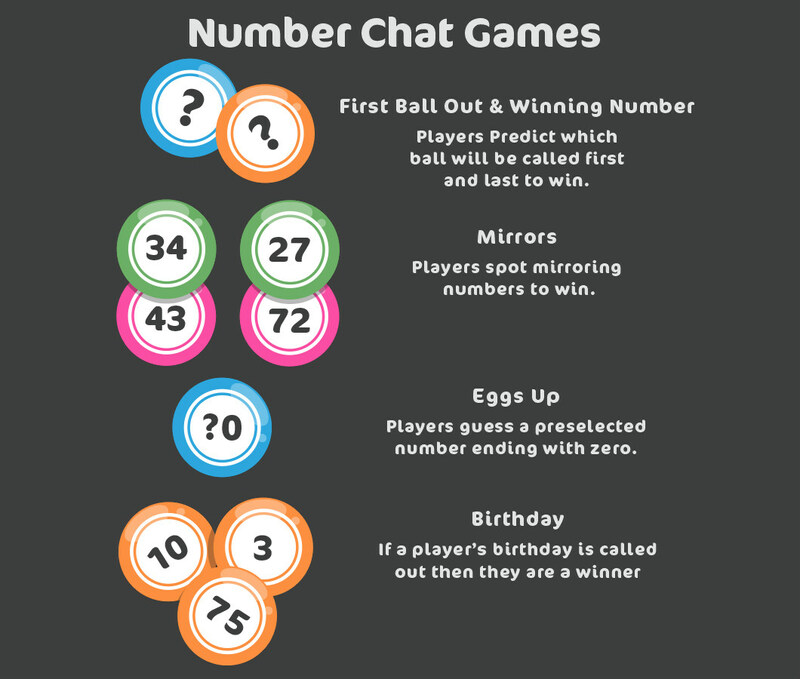 Birthday :- In a Birthday chat game, players must provide their birth dates at the beginning of the game in the following format 10-3-75 or 27-8-69… If all three numbers get called out, the Birthday winner must type “Birthday” in the chat room window and he/she will win a great prize! As you can see, there are so many different types of bingo chat games. However, there are also several commonalities to watch out for. Take note that some bingo sites may ask you for a minimum deposit before you can take part in a chat game. Other sites do not require a minimum deposit but they may require an active bingo ticket. Chat game winnings are often given in the form of a bonus or free cash, that cannot be withdrawn, but may be used to play for real cash in other games. Always remember to check your game rules and regulations before entering a chat game. Don’t forget that your chat hosts are also available to answer any questions that you might have. Above all, bingo chat games provide an opportunity to win some great free bonuses, plus each game is equally fun, sociable and interactive – So enjoy!